Admittedly not working from actual sales figures (as reported by vendors or manufacturers), but rather working from 'consumer panels', the Kantar data each month is widely held in respect. In this case, it's a report from Europe in general and Britain in particular. 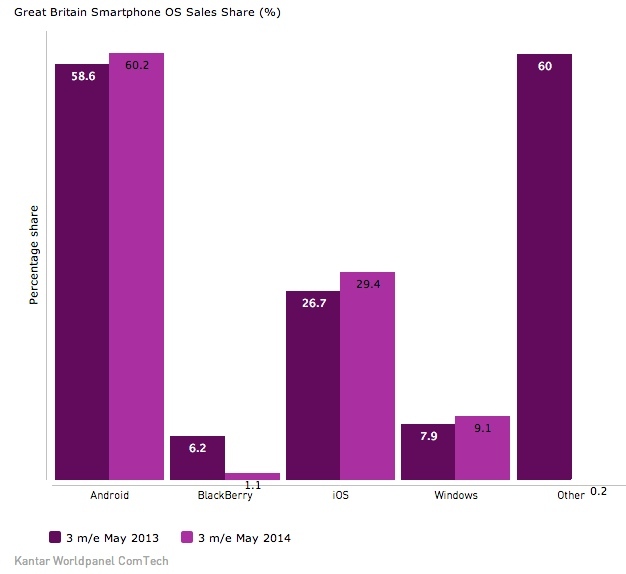 Windows Phone is up year on year, mind you, at 9.1% of the smartphone market in Britain in May 2014. Smartphone sales data from Kantar Worldpanel ComTech reveals that the new Samsung Galaxy S5 was the third best selling smartphone in Britain during May 2014, lagging behind its older iPhone 5s and 5c rivals. In general, consumers buying the Galaxy S5 were primarily attracted by its large screen size. This is something Apple is likely to address with the rumoured larger screen iPhone 6 launch expected in late September. Across the big 5 European markets (UK, Germany, France, Italy and Spain) Android remains the number one OS with 73.3% share. Apple is second with 16.6% share and Windows third with 8.1%. You can read the more detailed PDF here. Although focussing in its prose on the S5, it's good to see someone keeping track of the progress/penetration of each mobile OS from month to month. The year on year drop for Blackberry is particularly striking, leaving Windows Phone in an unashamed and unchallenged third place. 10% market share across most markets is quite viable as a business, but of course Microsoft will be aiming higher, especially now that Windows Phone 8.1 is being pushed out, the biggest update to the OS since its introduction. My gut feel is that Windows Phone can achieve 15% in many markets, but that quite a bit of this growth will be in the low to mid-range, where profits are harder to achieve. Good thing Microsoft has deep pockets and that its goal will be to get 'Windows everywhere' more than making serious money from mobile. Ultimately, Microsoft wants more people and businesses signing up to Office 365 and other cloud services.